The organization and governance of any sizeable group of people must be based on simple rules that are easily understood so there is no excuse for breaking them. That avoids one being able to claim that they were confused and didn’t understand the rules since the rules were confusing. An early historical example is that of Moses and the 10 commandments given on Mount Sinai. They were short and simple and clear. Anyone hearing them would understand them without the need of a scholar (or lawyer) to explain the nuances of the words and phrases. All fundamental law since time immemorial has followed the principle seen in that example, including our own United States Constitution of Government. It was written to be concise, -not verbose; simple, -not complex; crystal clear, -not ambiguous. It wasn’t enough to just write the document, -it had to be easily understood by the people because they all were going to have to make a choice as to whether or not they would accept it, ratify it, and thereby make it the fundamental law by which they, and all others, would have to abide for the rest of their lives. The simplicity and clarity of the Constitution laid out the skeleton of the government. The flesh would be added later by the Congress in conformity to the skeleton. Building and administering a government around the wording of the Constitution required that everyone fully understand it. That universal understanding was not muddied by uncertainty here and ambiguity there. Its meaning was not confusing, vague, or open to various interpretations (with the exception of the power to tax -having no limits placed on it). Those problems came later via the amendments added to it. But in the body of the Constitution there was no confusing language. The only uncertainly resulted from what was not written, -from the details that were missing and had yet to be fleshed out. The point of explaining this is to refute the contention that one of those requirements wasn’t exactly clear. In fact, it is contended that it is downright confusing, vague, and probably ambiguous. It is contended that only the Supreme Court can interpret and explain the true meaning of the words of the Constitution regarding who is eligible to be President, -when that is false. The true meaning is evident to anyone with a brain, just as it was when those words were written, read, ratified and adopted. They were crystal clear when written, easily understood by all, and it is only our distant modern ignorance and bias that prevent the universal acknowledgement of their meaning. It is strongly in the interest of a particular party in American politics to distort, confuse, obfuscate, and dilute the meaning of the words; “natural born”. Everyone understands the meaning of “citizen” but if everyone understood the meaning of “natural” and “born”, then a certain sitting President would be found to be illegitimate. That is a conclusion that the establishment cannot allow because it would result in a constitutional crisis like this nation has never seen and probably will never see again. But in defense of the truth, let’s examine the facts as they existed when the Constitution was written, -as well as throughout all of human history. The meaning of “natural” and “born” are derived from natural law. They are so closely related that together they create a sort of reinforcing redundancy. The meaning of natural is uncontestable, but dishonest minds have worked to completely twist the meaning of “born” thereby creating confusion and an impression of ambiguity. Their goal is to convince all that “born” and “birth” are somehow synonymous with geography, namely national boundaries, and the magical power of being born within them. They do this by using false logic. 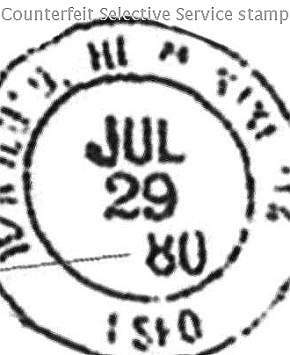 The concept they push is that by simply being “born in the United States” one is automatically a citizen “by birth”, -regardless of the fact that there is no basis in federal law to support that claim, -and in fact, there is a long history, both administrative and constitutional, that counters and refutes that claim. The falseness of their logic is exposed by untwisting the concept that by being a citizen at or upon birth, one is therefore a citizen by birth. Reality is understood by looking at what is natural. One is not a human being merely at birth, but is a human being by birth to human parents. Being human does not begin at birth but at conception. One is human by nature, not by the event of birth. This relates to the two types of citizenship connected to birth. One is natural, the other is legal/ statutory, artificial, -meaning: natural-ized. There’s a principle that pertains to children born to foreigners. In many countries, (the U.S. included,) the law is that such children are members of the nation where they are born only if their parents are immigrants and not mere visitors or diplomats. By law they are considered to be naturalized from the foreign citizenship of their father and/or mother into domestic citizenship and that automatic naturalization begins at birth. They are natural-ized citizens from/at/ upon birth, but they are not natural citizens because they were born to foreigners. If foreign parents first become natural-ized, then their children will be natural American citizens because they would be born to citizens and not foreigners. Now let’s look at the word “natural”. In every group, whether family, clan, tribe, or nation, the most fundamental element of group association is that of identification. Is one an enemy or a friendly? Is one a member or a non-member? Is one a natural member or an adopted member? One’s status is determined by the answer to these questions. Natural membership in the group is the result of being born into the group. No persons who were not born to group members will ever be describable as natural members. What is true in a family sense, is also true in a tribal and national sense. Rather, outsiders become members by adoption. The group leaders agree to adopt outsiders into the group and allow them all the privileges of natural members except one, and that is that they cannot be permitted to assume the office of the Chief. That is a responsibility reserved solely for natural members because their allegiance to the group is unquestionable. But what if the daughter of the chief is impregnated by an outsider and gives birth to a son? What will his status be? It depends on how they choose to deal with him. They can abandon him near a gathering of female outsiders (like the mother of Moses), they can kill him, or they can adopt him. Whatever they choose, the result is one that is determined by human choice and not by nature. If he is adopted, his adoption into group membership is by permission, not by nature. He would be an adopted member, not a natural member because he was not begotten by a father who is a member. Only members can pro-create natural members/ natives/ citizens. Outside males cannot pro-create natural natives or citizens. Consider the example of artificial fertilization. If a queen is married to a King who is sterile and she therefore resorts to achieving pregnancy via another man’s sperm, is the off-spring truly the King’s seed and of his blood-line? Obviously not. Such a son would be a half-blood heir. If later, the King becomes potent and impregnates his wife, the child will be his full-blood heir. Which will the King choose to inherit his throne? The half-blood first born or the full-blood child born later? He would choose the full-blood child because he is his natural off-spring and carries his blood-line. One is fully natural while the other is artificial, or half-blood. The same natural principle applies to citizenship. The citizenship that is natural is never half-blood. Rather, it’s always full-blood. Any mixture of another bloodline/group membership/nationality results in an off-spring that is accepted by the principle of adoption, not natural creation. The fact that such an adoption is from birth does not make one a natural member, it only makes one a life-long member with all the privileges of membership except one, -ascent to the Throne. Or in the case of the United States, -the Presidency. In 2008 the Constitution of the United States was ignored like it didn’t even exist. All the powers-that-be remained silent least they be accused of racism for attempting to block the first mixed-race candidate from attaining the American dream. Now it’s too late for them to say what they know or suspect because they would look like the cowards that they are. So we as a nation are riding on a giant train that is no longer rolling on the tracks because we have been bamboozled into thinking that everyone couldn’t get it wrong, and especially not get it wrong on purpose. But that is exactly what has happened. Congress is stupid or complicit because the Senate passed a resolution declaring that John McCain is a natural born citizen of the United States because he was born to American parents. They got that right, but what of his fellow Senator and presidential opponent who was not born to American parents but was instead a half-blood statutory citizen? They and everyone else remained silent as he was illegitimately certified by the Democrat Party leadership to be a presidential candidate in all 50 states -with the exception of Hawaii because they had no evidence that he was born in the United States. But after secret talks with the authority that blocked the ballot certification, suddenly it became OK. The fix was in and it was in big time. 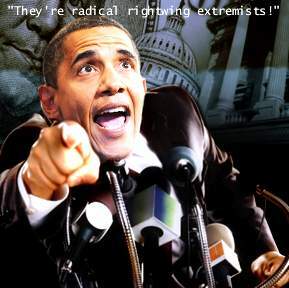 And now we will soon be witness to a repeat of this deliberate deceitful travesty against the Constitution and rule of law as he is again certified to be eligible in all 50 states because all of the systems of our society and government have been slowly but surely infiltrated for over 100 years by the enemies of the Constitution and the principles on which our nation was founded. They can’t get their way via constitutional amendment so instead they resort to simple majority legislation, or supreme court decisions, and totally ignoring fundamental law that impedes their goal of creating a centrally planned and controlled utopia of compliant sheep who obediently follow the wise orders of their masters, -the elites, the academic and professional class that knows for certain that it is superior to the masses and far more capable of wisely making all the decisions for them. Welcome to the impending future. -the paradise of a democratic Marxist oligarchy. It gained a huge boost back in 1942 in the biggest way possible with the Supreme Court decision in Wichard v Filburn in which the court ruled that Americans do not have the right to grow food on their own land for their own use. That was when the dictatorship of Washington took a giant leap forward. After that Congress could do pretty much anything that it wanted, and that’s exactly what it has done. Liberty had a limb chopped off and today the public is just becoming aware of how much individual autonomy and state authority has been ceded to Washington and to bureaucrats in general. In this Bizarro world, the American people have ignorantly elected the man that spoke with the greatest voice and platitudes even though he is constitutionally barred from serving in the office of President. Superficiality is what gets people elected in contests that in the end boil down to a beauty contest. Obama was more attractive than McCain. Words matter, but ones voice and appearance matter perhaps as much or more. 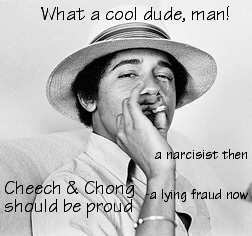 Would Barack Obama now be President if his voice was similar to Barney Fife’s voice? How about Homer Simpson’s? One will win any contest in which charisma and big promises are combined into one nice big package of Hope and Idealism. Why shouldn’t such a candidate be allowed to win? Because he isn’t what he’s supposed to be. He isn’t a natural American. He’s an adopted, half-blood, statutory, naturalized American and he isn’t even that if he was born abroad (such as Kenya or Vancouver) because his mother was too young when he was born to convey citizenship to him if born abroad. So we had an attractive, unvetted affirmative action stealth candidate with a black hole where a public background should be, and instead of being a natural American citizen with singular (not dual) parental citizenship, he is a hybrid off-spring of a foreign outsider, the product of two different continents, countries, societies, and nationalities. Diversity can be a good thing, but it is not a natural thing. Just ask the Japanese if they prefer the natural uniformity of their nation to that of the unnatural Islamic diversity of say London or Paris. But even with the American lip-service toward diversity, no outsider’s son is lawfully permitted to become Chief. No half-blood prince is permitted to become King, and NO PERSON, -except a natural born citizen, shall be eligible to the office of the President. 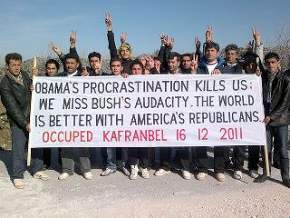 Why do you birthers try to invent things that the founding fathers fought so hard to make sure would never happen here? Our founding fathers looked at their oppressors across the ocean and saw the rife corruption where the only way you could rise above the squalor, is if you had the right parents. The founding fathers wanted a country where hard work and dedication determined your success, not what family you were born to. Why do you birthers want to wipe away the very foundation of what makes America great? Why do you hate our constitution that much? It is fortunate that every Judge, every Constitutional expert, all of Congress, and any American with more than half a brain can see right through your foolishness. Thank God you will never be more than a lunatic fringe handful of nutbags who have lost hundreds of times in four years, and have nothing to show for it. You possess the knowledge and insight of a gnat. 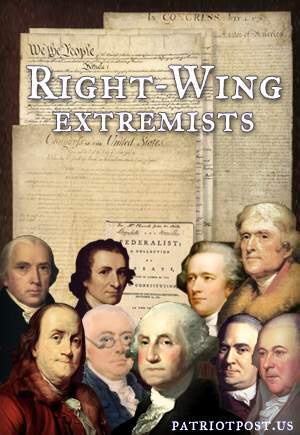 The founding fathers knew full well that no woman, no African, no Asian, no Catholic, no Jew, no Muslim, no illiterate, no half-British son, no alien nor an alien’s son would ever run for or be elected to the office of the President. 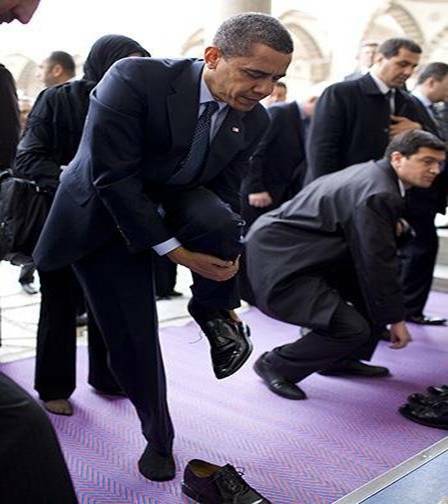 The position of Commander-in-Chief was reserved for a entirely American natural citizen. No one with foreign ties could be entrusted with the power of that position. Any child can understand that fact. Why the heck can’t you? The presidential eligibility clause is purely exclusionary, -NOT INclusionary. 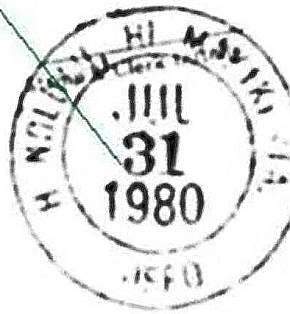 NO PERSON shall be eligible to the office of the President EXCEPT a natural born citizen. 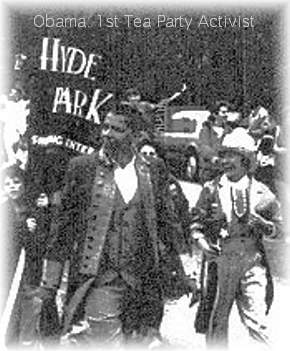 The era of inclusion ended when the last male Protestant citizen who was a citizen when the Constitution was adopted had died. Then the era of a mere “citizen” being President was over, and the era of only a natural born citizen began without any possibility of exception. How about you read and learn a whole lot more before ignorantly spouting off? As for the courts, no court in the land has ever heard the facts that I’ve shared in dozens of expositions on the nature and origin of citizenship. They can’t be said to have dismissed that which they’ve never heard. shared are false. It’s because they are not false. There are only three kinds of people; those who know the truth, -those who don’t know the truth, and those who know the truth but deny it. The “experts” whose feet you kiss are among the latter two. No one who backs the socialist-in-chief will accept the truth because it destroys his legitimacy, along with his Supreme Court appointments and signed legislation. Nor will anyone who supports the status quo in Washington, whether they be Democrat or Republican. Have you ever seen a bluebird in a jaybird’s nest? Of course not and you never will. Barack Obama would never have become president if he had a father other than a black father. 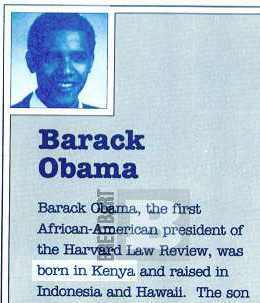 Had his father been a “white” Kenyan, his eligibility to be president would have been immediately and successfully challenged. 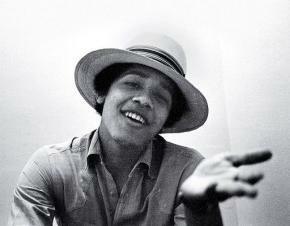 The mere suggestion that Obama was ineligible to be president would have settled on the fact that he is half black and it would have been screamed that he was removed from the ballot, not because he was ineligible by Article II of the constitution, but because he was black. The problem with Obama is well understood and explained by Dr. Morris Massey in his videos and films, “YOU are what you are because of where you were when”. 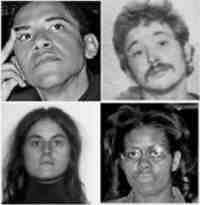 Obama’s formative years were lived outside of the main stream of the United States under the tutelage of known communists. 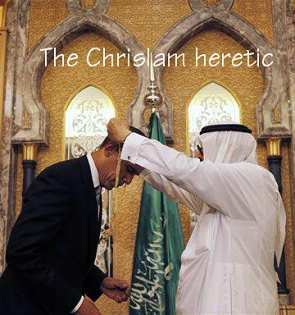 Had Obama been properly vetted, he would not now be President of the United States. Article II, Section I, Clause 5 of our constitution has stood for 236 years as a sentinel to protect the US. 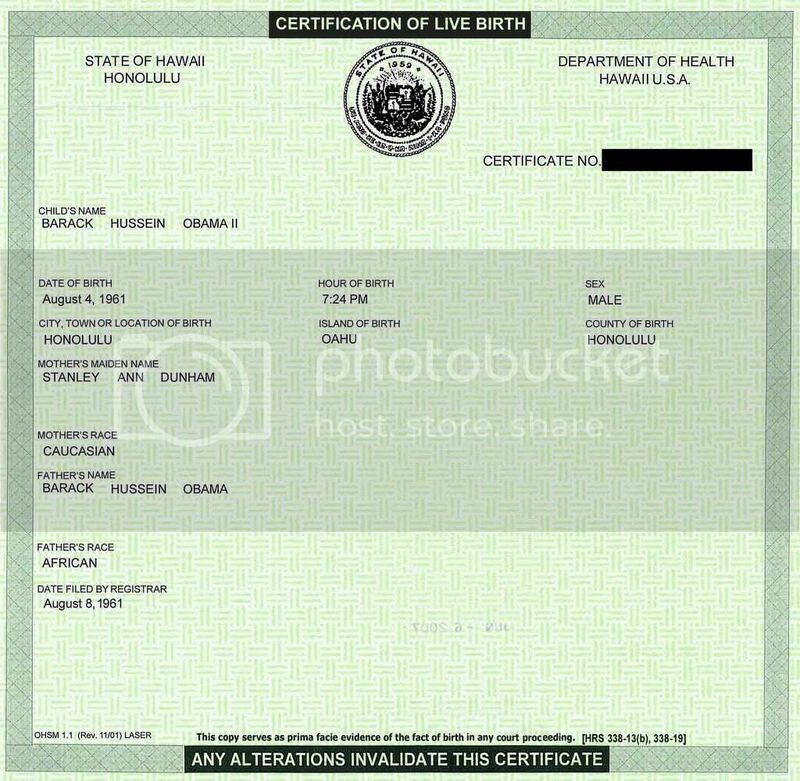 Several cases are now before the Supreme Court challenging that Obama is not a natural born citizen as required in Article II. He is not based on prior Supreme Court decisions, notably Minor v. Happersett which defines a “natural born citizen” as a child born on US soil to parents who are citizens at the time of birth. 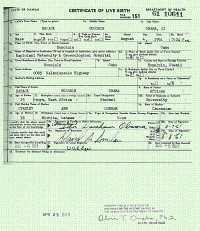 Obama is ineligible, not because he is black, but because his father was a subject of the United Kingdom at the time of his birth and Obama was born a subject of the UK. 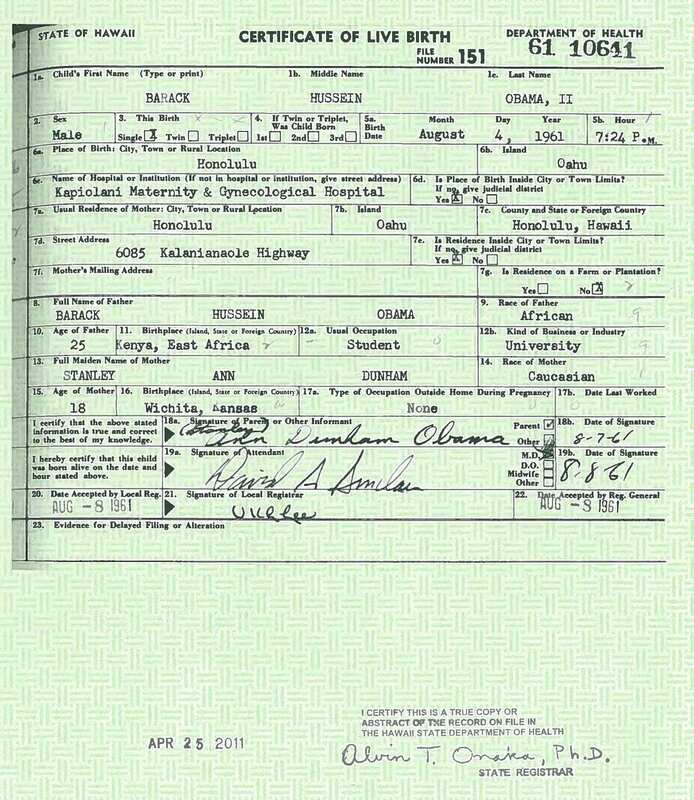 All the facts relating to Obama’s birth location, parentage, citizenship and scholastic records are going to be revealed sooner or later and his continued hiding this information is only going to make matters worse for him and for those guilty of misprision.